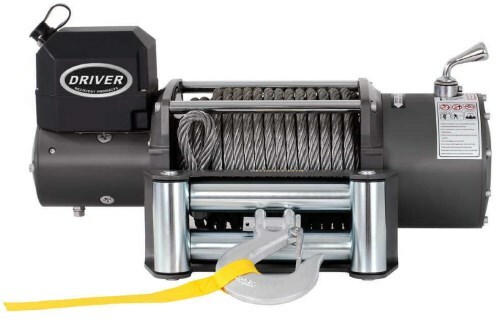 Driver Recovery Products offer you a top-notch quality electric winch able to pull up to 17,000lbs. Sounds great, doesn’t it? Want to know more about the heavy duty recovery winch considered one of the premium models? Then let’s get started reviewing it. First of all, it should be noted that the winch is associated in every user with the great flawless performance, high-quality of build, and a reasonable cost, which is one of the crucial criteria, when choosing a winch. On today’s market, there are a lot of products that are worth attention, that’s why it would be incorrect to say that LD 17-Pro electric winch is the best of the best. However, it is by right can be considered one of the best devices available nowadays. The manufacturer guarantees the perfect quality of all constituent parts of the winch, which has a modern design and a number of features making it a good option to choose. Which Characteristics Does LD17-PRO Electric Recovery Winch Have? If you have followed instructions carefully, then you can use your winch. Let’s plunge into details after you have familiarized yourself with the main model specifications. The winch is really a great deal as it is able to deal with any complicated situation you may face anytime exploring terrains. Thanks to the series-wound motor with low-loss, you will benefit from the guaranteed power that can be successfully maintained by motors of these series. The winch has a powerful fast motor, which works flawlessly. What else is inside the winch? There is a great 3-stage planetary gear system. Many models are equipped with such system, however, this one stands out. Every component here is produced to tight tolerances. How will you benefit from this feature? This provides a guarantee that everything will work smoothly for years. The durability and high performance is the combination of pros you will enjoy if give preference to this model. Probably, it will last even longer than your vehicle as every detail is made so that it is able to operate for a long period of time without the need to fix anything. On the winch top, you will find the frictionless free spooling clutch. The use of an automatic braking system provides an opportunity to hold the load if you don’t apply the power of the motor. The winch has a top-notch quality cable, which durability shouldn’t be questioned. Besides, the obvious pros, it is easy to use. It would be wrong not to mention the perfect finish of the winch model. It is not only of top quality but also can boast of the premium look. You shouldn’t worry that with time it will look not good. Even in ten years, it will look not less great than today. Due to the weather-resistant switches and special coverage of all electrical connections intended to protect from water, you have nothing to worry about if you have chosen an inappropriate weather for your off-road adventure. LD17-PRO will fight against any unwanted trouble professionally. You are recommended to consider getting this recovery winch if you are an experienced off-road lover who needs a reliable device of the premium quality that can be used on the regular basis.